Blessing Bags- A Big Success! 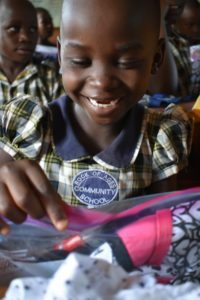 Toys, washcloths, toothbrushes, stickers, composition notebooks- my dining room was bursting at the seams for over a month as we collected items to create blessing bags for every student at Rock of Ages. We received over 70 blessing bags directly from sponsors. Thank you so much to those who were able to send those to us! Students love the personal touch, receiving letters and pictures of your family and knowing you have them in your thoughts. We were also able to collect so many donations from the Bellingham, WA community and I want to personally thank all of those who participated in our local packing party where we stuffed bags for over 150 students! To say our “Blessing Bag Day” was a success would be a total understatement. While in Uganda we stay in Mbiko with Betty Wasswa, the Director of Rock of Ages, and her family. My team and I enjoy going for a nice stroll each evening when the sun begins to fade and the air cools to a more agreeable temperature. We often see children who attend Rock of Ages. They yell our names from their yards and come running towards us as we pass by their homes. We definitely added to the excitement of Blessing Bag day by sharing with a few students that we had a big surprise for them the following day! Word spreads very quickly through this small village and by the time we rolled up to school with giant duffle bags and boxes bumping along in the bed of the truck, hundreds of little brown eyes peered through windows and doors and a the soft hum of their excited whispers overtook the school. We began with nursery students. Those in Baby Class (pk-3) and Middle Class (pk-4) were very unsure about what was happening at first. 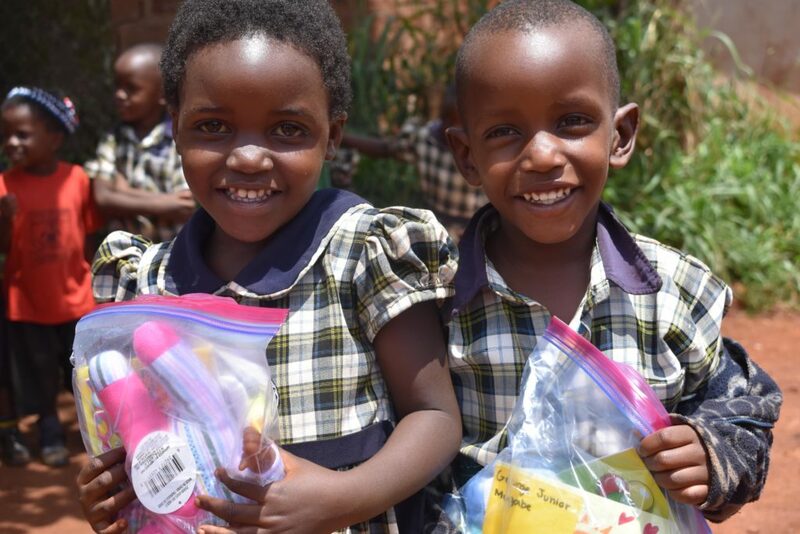 Each of these students received a beanie-baby or a baby doll in their packet and once they realized these large bags also included sweets, stickers and other goodies, the nursery area was full of squeals and giggles as they broke open their bags and explored their gifts. Within the hour, faces were covered with sticky slobber from lollipops, stickers of all shapes and kinds and smiles that would remain consistent through each class for the rest of the day. Following lunch, we began passing out packets to the Primary students. 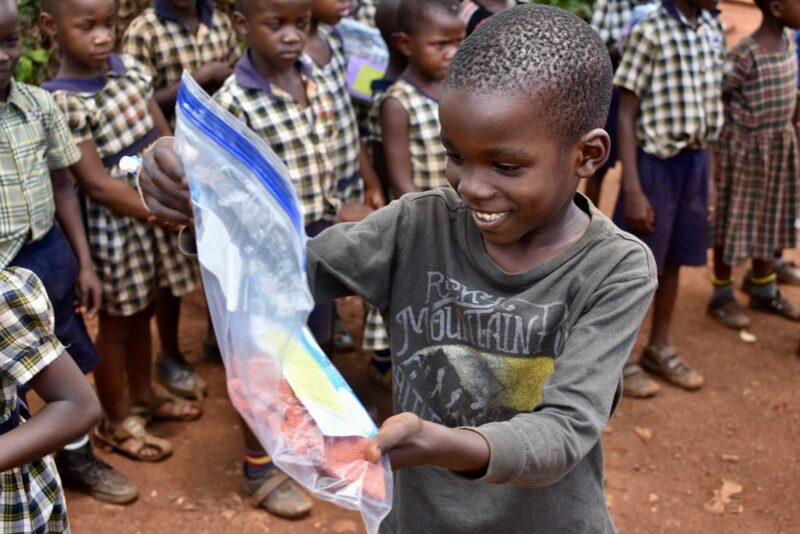 The content of each packet was consistent within each class although every student received a toothbrush, toothpaste, washcloth, pencils, erasers, stickers, candies, and some kind of toy! We later learned the 34 mini play dough tubs we passed out to first graders could have used some explanation as many students were caught trying to eat the brightly colored dough, thinking it was a sweet treat! 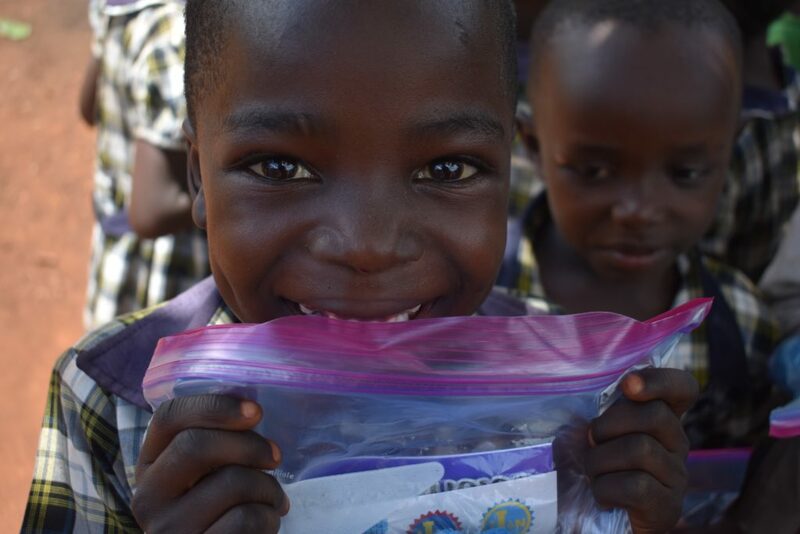 With giggles and excitement all around the afternoon ended as we finished passing out bags to the Primary 7 students. This small class (only 18 pupils) will be sitting for their Primary Learning Exam (PLE) in just one week and following that their time at Rock of Ages will have come to an end. It was such a blessing for us to deliver special goodies and messages from their sponsors, as a reminder of the love and support they have moving forward! 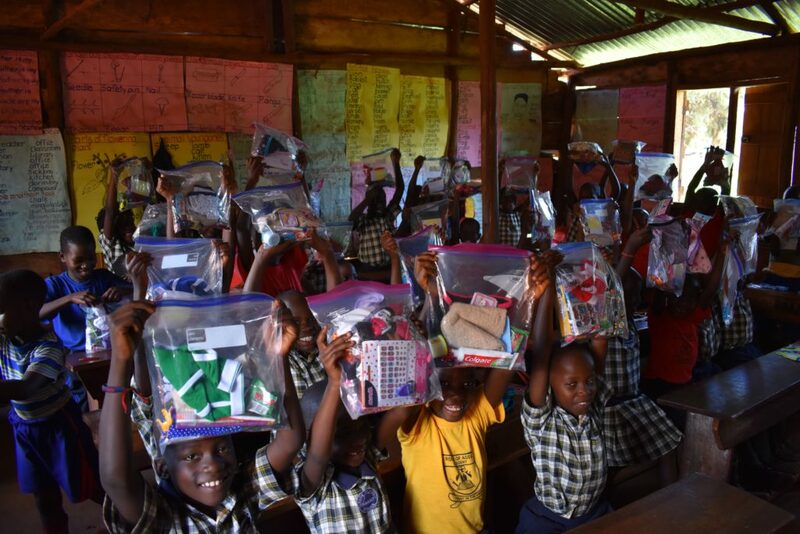 Bet the givers were blessed as much as those who received the bags. Their big beautiful smile are so special. Thank you team, for making that trip. So fun to see the students’ sweet faces. Safety, health and blessings to all of you!